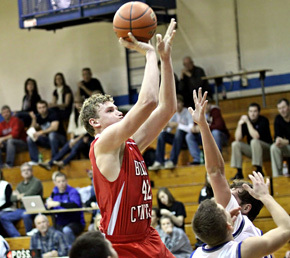 Boone Central’s 57-38 decision over host Lakeview Thursday – BC’s second straight after opening the season 0-4 – was just what the Cardinals needed heading into the holiday break. “That was the best Christmas present I could get,” said Cardinal Coach Dan Zoucha following the contest. “Hopefully, it was a good present for the players as well. Boone Central enjoyed one of its best shooting performances of the young season, completely dominated the boards and limited turnovers, all while playing stifling defense. With Beau Bremer scoring five points and Brett Temme dropping the Cards’ first three-point field goal of the contest, BC reeled off a 12-2 run to knot the score 24-24 at intermission. The teams traded punches through a tight third period, with Boone Central edging in front by one point, 35-34, at the quarter break. The final stanza was all Cardinals, however. Boone Central’s defense clamped down on the Vikings, limiting quality shot attempts and holding the hosts without a fourth-quarter field goal until just 1:37 remained in the contest. Lakeview also helped the cause, connecting on only 2-of-9 free throws in the period. Lakeview was within two points after Jack Shadley’s free throws with just over seven minutes to play, but BC followed with a 16-0 run that decided the outcome. Tyler Hedlund nailed a three-point attempt and scored six total points during the burst and the Cards sank 12-of-15 free throws, turning around their early struggles.